eBay is rolling out its highly anticipated new selling tool to U.S.-based sellers on the platform. The new Seller Hub, which was introduced in beta last year, is a new dashboard for sellers that puts listing and marketing tools within a single interface. Sellers will be able to manage orders and inventory, and even receive insights and selling recommendations to optimize their participation on the network. Although Seller Hub is best suited for professional sellers currently using My eBay Selling, Selling Manager or Selling Manager Pro, anyone with an eBay Store subscription will be able to access the new product (it will ultimately be the default tool for managing eBay listings according to the company). While improvements to inventory management and reporting will certainly be well received by sellers of all types and sizes, it's really the data that eBay is making available for sellers that is the most noteworthy development. 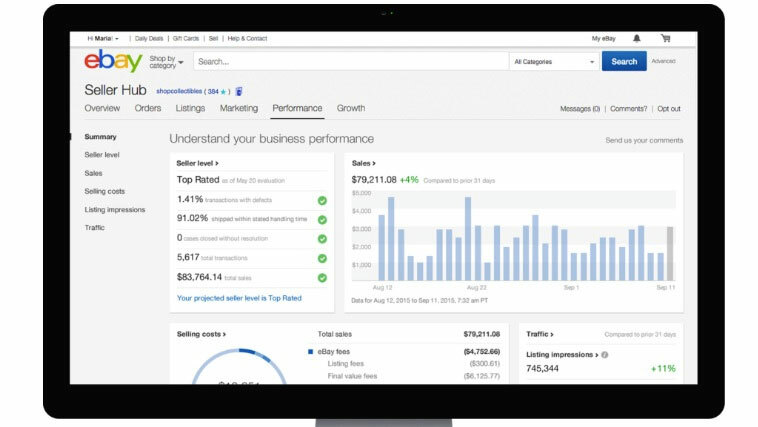 In addition to a new "Marketing" tab (which enables sellers to both measure the impact of current promotions and then manage and promote those listings) Seller Hub also now includes a "Growth" tab, which analyzes billions of data inputs that sellers can use to help them research and increase the likelihood of sales. Are you an eBay seller that has used Seller Hub? Share your experience with other Website Magazine readers and visitors by submittnig a comment below!